A series of experiments exploring food and meals as performed memories, and cooking as archival practice. 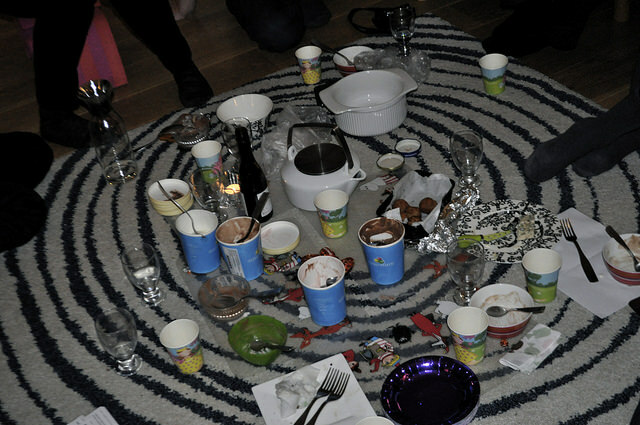 The first Eat a Memory gathering took place in the end of November 2014. At the dinner, memories were performed, shared, collected, and in the following shared again. Figure 1. Performing memories CC:BY-NC. Bring a dish from your childhood memories. An ingredient, a fruit, a soup, a dessert – something that your grandparents served you when you were a child. If they had a garden, bring something that could have grown in their backyard. If they lived in the city, bring something that they got you in the convenience store next door. The evening is about performing memories by tasting flavors from your childhoods, and sharing these memories by sharing a meal together. A meal as a performed memory, as an archival practice, as an archive that travels through time and place, from mouth to mouth. Figure 2. The menu CC:BY-NC. Figure 3. 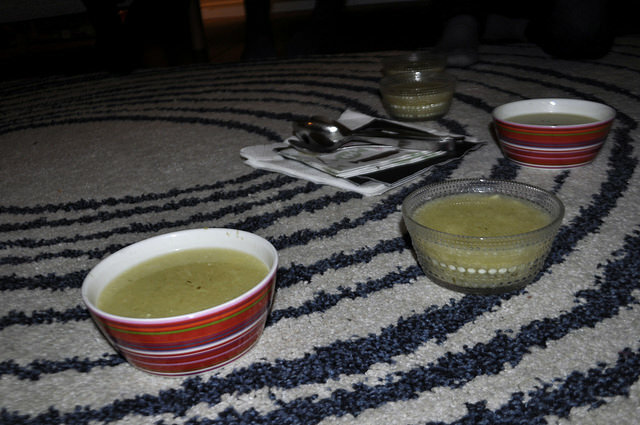 Pickle soup of Perpetua CC:BY-NC. Like any other soup, depending on the amount of serving adjust the amount of ingredients. Fry onion until it crystallizes. Add water, (broth) and chopped vegetables. Add the chopped pickles or the pulp. Salt and pepper. Add sour cream at the end and sprinkle with chopped dill (preferably fresh). Figure 4. 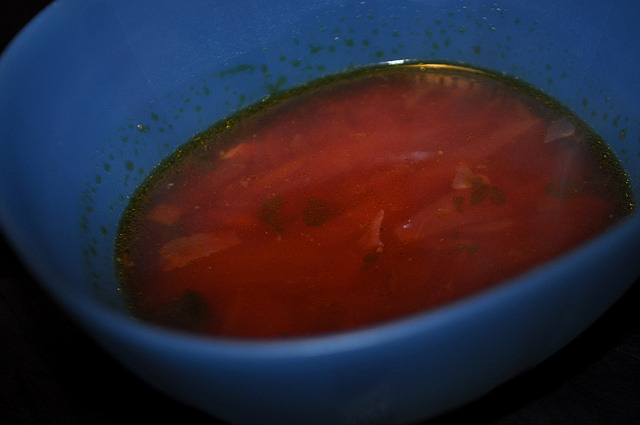 Ukrainian borscht CC:BY-NC. Let’s just say I was fonder of my mother’s mother even though she died before I was born. My father’s mother scowled a lot and poked me in my ribs. She cooked wonderful “Pirohed” (a phonetic pronunciation of her Ukrainian word for Perogi, that more well known Polish version of potato dumpling) and borscht. I used to sigh with relief when she served either of these because I actually liked them. But the borscht was best because it was so strange. Beets, carrots and tomatoes from her large urban garden just outside Montreal, dill that grew to the size of bushes in preposterously small and dry small openings between the concrete path and the side of her brick house. 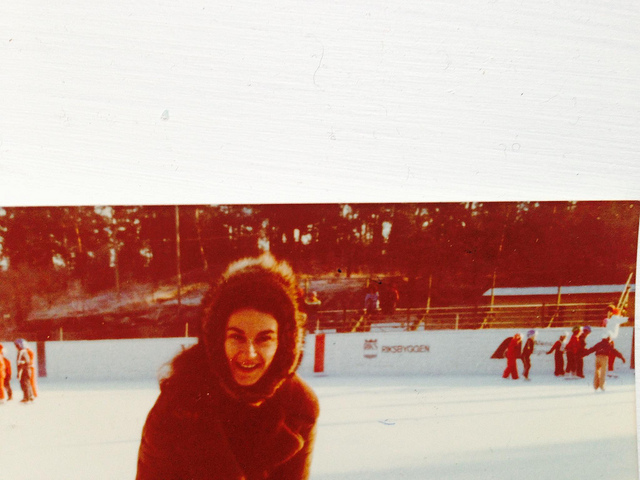 Her borscht was always vegetarian, for some mysterious reason, and it was that luminous, almost fuchsia pink that I always appreciated as a child. So when I was asked to think of a food from grandmothers for a Memory to Eat it surprised me that I thought of the Ukrainian and not the Irish side. Next, how to find the recipe because she died long ago and was not open with any information regarding recipes, or even distant family members for that matter. I felt almost that I was not permitted to cook this sort of soup. An internet search yielded the following recipe. At first it seemed a little bland but I ignored it for an hour and it was fantastic. In my shopping haste I forgot the dill and the sour cream, but had spring onions and, ever present in Swedish households, filmjölk (butter milk). I’ll cook it again because now it opens up a side of my grandmother that does not make me feel grumpy and because it is now a reflection of my reconstructed or re-enacted memories in Sweden. Among my grandparents, I only got to know my grandmother (farmor) Fiffi (Britt), and she was not inspired or frequent in the kitchen. During her life she lived, as my father as a child, with maids cooking and serving the large family. In her later part of life, I got to spend time with her in France, Nice where she would spend half the year and I could experience a little of her own cooking and preferences. 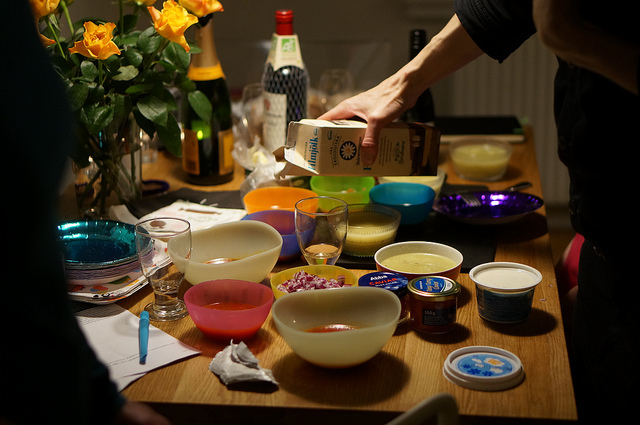 She used few fresh ingredients, in favor of spreads of mayonnaise, spagetti, eggs and petit points… For the “Eat a memory” event, I decided to use a dish and recipe from my mother, Blini, that she and I liked a lot and enjoyed together. She was never a mother who cooked or baked much, as a single full time working, cooking became mostly a must and pressure. The blini dish is something that I have taken further into my motherhood, and experimenting with. I felt it was something I wanted to share during this event. My variation of the original recipe is: Eggs, buckwheat flour , almond flour, oat milk, butter for frying. Figure 6. Peas, butter, and salt CC:BY-NC. Asta was born in 1926 on the island of Öland, the youngest of many siblings. Her mother was strong and independent, which made little Asta grow up wanting to be the opposite. She wanted to please, to not make any waves and find a man to settle down with for life. Someone nice who would take care of her. Food was not so important for my grandmother; she didn’t really like to cook as an everyday chore. But it was important and proper to gather all the relatives around meals. So the family meals were important. Great classic Christmas and Easter dinners. (No alcohol, not allowed in her Småland household) with everything you could imagine, and a large family who swarmed around a house decked out for Christmas. What I remember most vividly though, are the more intimate Sunday dinners that were equally classic. My grandmother would always serve some kind of meat, potatoes, gravy, and vegetables. I think especially about those vegetables. There were always carrots, beans, and green peas. Most from a jar, possibly frozen. Rarely if ever fresh vegetables. 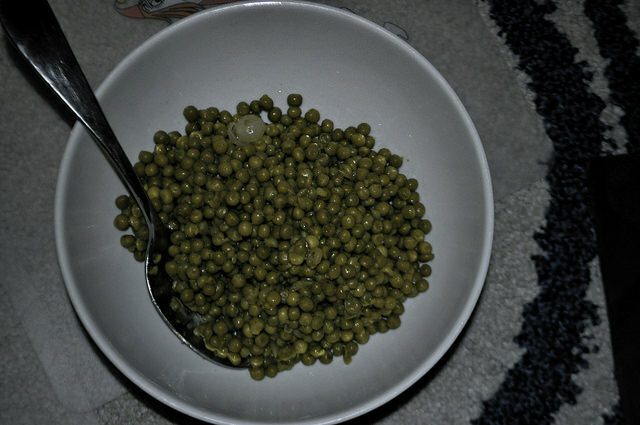 Those green peas: boring, unsalted, unloved. I hated peas. It was my mom and dad and later stepfather and stepmother who took in the whole world of cuisines into my life and throughout childhood. Many different people from various cultures and traditions taught me that food is something important in itself, to respect, value, explore, and, above all, learn how to prepare. Now, many years later, when my grandmother has passed away, these green peas have become a symbol for how beautiful and wonderful those Sunday dinners really were, but also a symbol of how my grandmother was stuck in a life as a woman, mother, housewife for a long time. It was only after her 50th birthday or so, when the kids were gone, that she could allow herself to drop some of those social musts, and things one had to do. I have all these memories that are not really my memories of a kind of captivity and boredom, mixed with the young child’s delight in running around grandma’s legs in the kitchen. And I think of her stern smile as she snuck me a piece of whatever it was that she was making, to taste before anyone else. And I think to myself that the green peas are really good, even worthy of love. Figure 7. Friday dinner CC:BY-NC. What I really wanted to bring to this gathering was kroppkakor, a dumpling made from potatoes and pork, and seasoned with ‘kryddpeppar’ (allspice). And, I wanted to make it according to my grandmother Ulla’s recipe. Unfortunately, she has no recipe. She makes the dish from memory, not from written instructions. She knows how much potato starch to use only after having ‘sensed’ the texture of the dough. The recipe is embodied in her hands and it only manifests itself through practice. 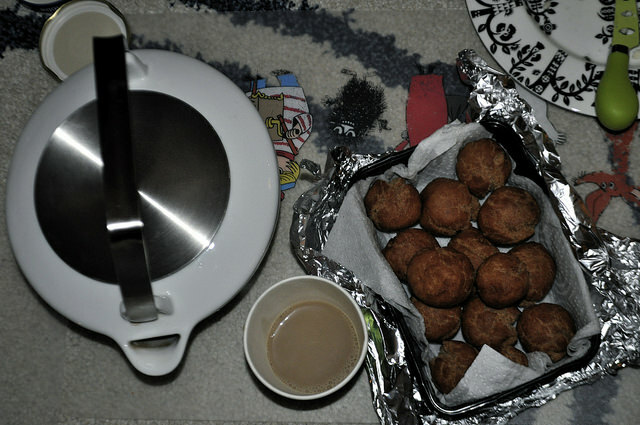 This is not to say that I have never tried to make kroppkakor. I have. And I have failed. That’s why I didn’t even bother to try for this Eat a Memory event. 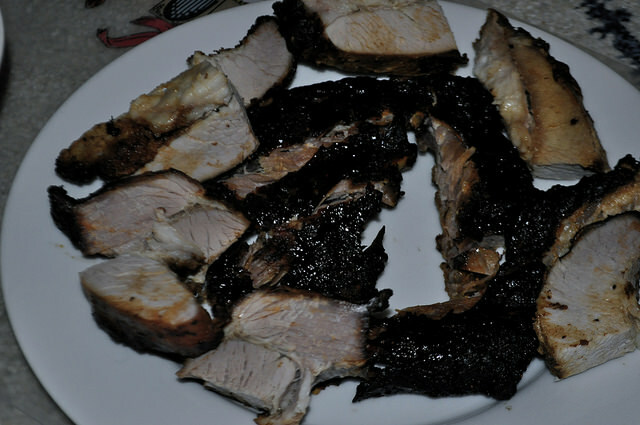 Instead, i brought spareribs, just the way my mother made them. The way she ‘made’ them was to buy them, grilled but kind of lukewarm, from the grocery story where she worked. This was a Friday thing, and I remember how I looked forward to her coming home on Friday evenings with spareribs and some potato salad. That was the beginning of the weekend. Not some fancy homemade dinner, which is very similar to how my own family celebrates the start of the weekend. Figure 8. Idun and Nisse in their garden CC:BY-NC. 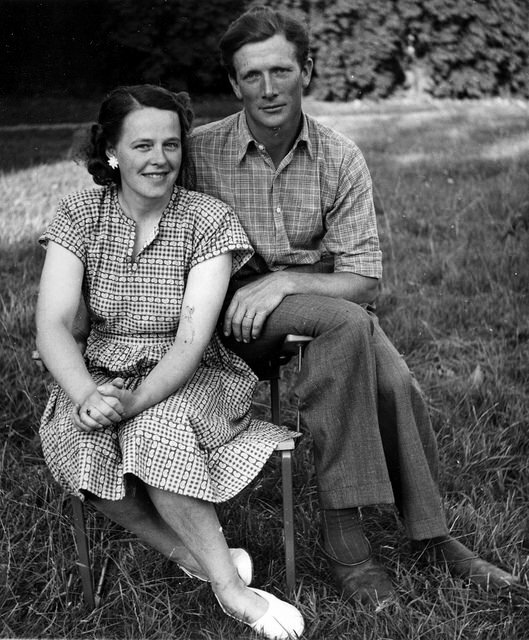 As a child I spent a lot of time with my grandparents at their farm. I remember assisting (as I saw it) my grandpa Nisse in the barn cuddling and taking care of cows, pigs, cats and sheep. I hung out in their kitchen helping my grandma Idun to prepare the many meals they had in a day. When looking back, trying to recall a normal day at the farm, I see that they actually had something to eat every second hour. 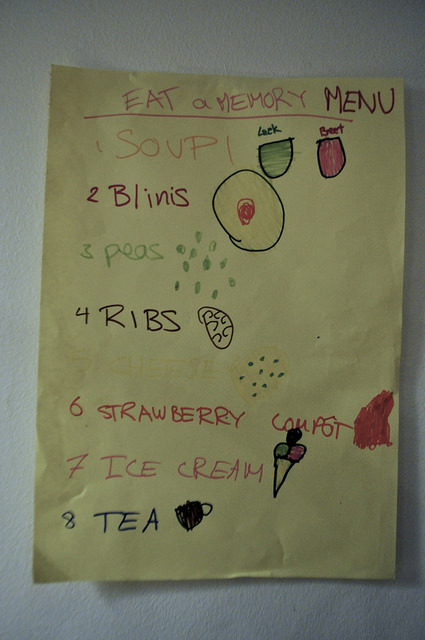 The meal breaks was a way to structure the day. At 12 o’clock sharp lunch, always including dessert was served. A typical dessert that I clearly recall was strawberry compote, made from berries from their own garden and served warm with cold milk. Put strawberries, sugar, and water in a saucepan, and let it all boil for five minutes. Take the pan of the heat, and mix the potato flour with water. Pour the mix in the pan while stirring. Put the pan back on the heat, and bring it all to boil for a short time. Serve warm with cold milk. Figure 9. Rocky road, chocolate, and vanilla ice cream CC:BY-NC. On Sundays, Pops and Becky would come over from Brighton Beach to the center of Flatbush were we lived in a 1 family house. We got to spend the day with my dad’s parents, hearing stories of the old days. Talking about the turbulent and special times of 70’s from civil rights, moon landings, the King and Kennedy assignations. 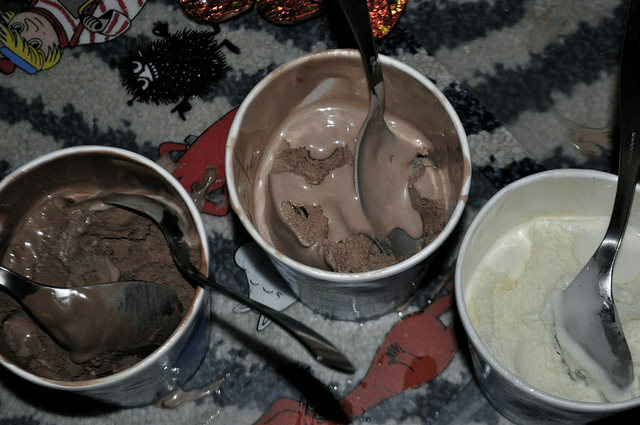 I was the oldest kid, so my job was to get the vanilla, chocolate, and strawberry ice cream, down at the corner store. It was my introduction to work, I got 2 or 3 dollars and had to walk down to the end of the block to Avenue M. Then 2 short blocks up to Benny’s the local Candy shop. I got to keep the change or to buy some comics. I got my first lesson in USA capitalism. Figure 10. Transatlantic style puff puffs CC:BY-NC. I don’t have many tangible memories left of my paternal grandmother. I only met her a few times on holidays to Nigeria during my childhood…and then (like many children of immigrants might relate to) the holidays lessened, and she became words in cards and letters, and an occasional abstract voice on the crackly phone line. Now she is spirit, exuding through sepia photographs. And yet she is closer than ever to me now. My mother’s mother I know much better and she is still alive. Although “know” is a strong word, since there is something about the reverent space between an African child and their grandparents that makes them both larger than life, but also deeply elusive. But she is a woman of food and cloth and music and prayer and laughter. Strong. And each sense can be activated by something she has expressed or created. And so one of my earliest memories is of morning tea she brewed in an iron pot. Typically English PG Tips (or Lyons) made sweet and creamy with carnation milk – colonial sundries mixed with practical adaptations in the tropical heat. This was after prayers tea, a smoky, steamy, comforting elixir for the soul. A reminder that the day had begun and there was work to do. I don’t recall eating “puff puff” with either of my grandmothers but it is a simple treat that is usually present at celebrations and gatherings all over Africa. It can also accompany tea at breakfast. In Tanzania, for example, it is called “Mandazi”. And even in the Diaspora, the Caribbean equivalent is called a “johnny cake” or simply “fried dumpling”. The promoted recipe is basically deep fried flour with water, some kind of raising agent like yeast or baking soda, and occasionally eggs. Most of the women I know lean towards the Caribbean version and make it without eggs and yeast. In short it’s a sort of doughnut, but not quite…definitely not as sugary. Yet very very moreish. In a large bowl, first mix all the dry ingredients together and then work in the butter/oil to make the mixture crumbly. Then gradually work in the lukewarm water with your hands until you have the consistency of soft dough. Dust a board, or your counter top, with flour and then knead the dough for a couple of minutes just to give it some gluteny energy, then leave it to sit for 30-40mins. Portion the mixture into small/medium balls, and then fry in hot oil until golden brown. Try not to fry too many in one go, depending on the size of your pot. When they are ready leave to rest on kitchen roll to drain excess oil. Figure 11. A table of performed and eaten memories CC:BY-NC.